If you are a skilled professional, planning to move to Canada on skilled permanent residence visa, you need to have good profile score as well. Canada is one among those countries which follow a point based system for allowing skilled immigrants in the country as permanent residents. Hence, your point score plays a key role in obtaining the PR visa from the Canadian government. Let’s understand the Canada PR process in terms of Express Entry System- the most popular point-based immigration system of Canada. Canadian permanent residency (PR) process can be divided in two parts. As a skilled PR applicant, your first step would be to create a profile in Express Entry system or any other PR program and subsequently, get selected in Express Entry pool, based on your CRS (Comprehensive Ranking System) score. The IRCC (Immigration Refugees and Citizenship Canada) will select the top ranking profiles (candidates with top CRS scores) from express entry pool through fortnightly draws, and invite them to apply for Canada PR visa within 90 days. Now, the second step is to submit complete Canada PR application along with the required documents. The immigration office will assess and verify the application and documents and if all found correct, PR approval will be issued in the name of the applicant. Hence, if your CRS (Comprehensive Ranking System) decides, whether or not you will reach the 2nd stage of the process. What is Comprehensive Ranking System (CRS)? Comprehensive Ranking System or CRS is a point system that evaluates the eligibility and suitability of a PR visa applicant based on his total points scored for age, education, work experience, Language ability (English or French), etc. Higher the CRS score, greater are your chances of obtaining ITA (Invitation to apply) for Canada PR visa from IRCC. IRCC will launch a draw every fortnight (15 days) to select top ranking profiles from express entry pool. For every draw, it announces cut off marks (i.e. CRS score requirement). The applicants who achieve the cut off marks get the ITA (Invitation to Apply) for Canada PR Visa. How many CRS Points are enough to get the invitation from IRCC? The qualifying marks criteria changes in every draw, so there is no fixed pattern as to what will the qualifying marks or CRS score requirement in the next express entry draw. Let’s try to get an idea from the latest EE draw occurred on April 11, 2018. In the 7th express entry draw of the year occurred recently, IRCC demanded 444 CRS points. Hence, as per the latest EE draw trend, if you have the CRS score around this mark, you stand the strong chance of acquiring approval for Canada PR from IRCC. 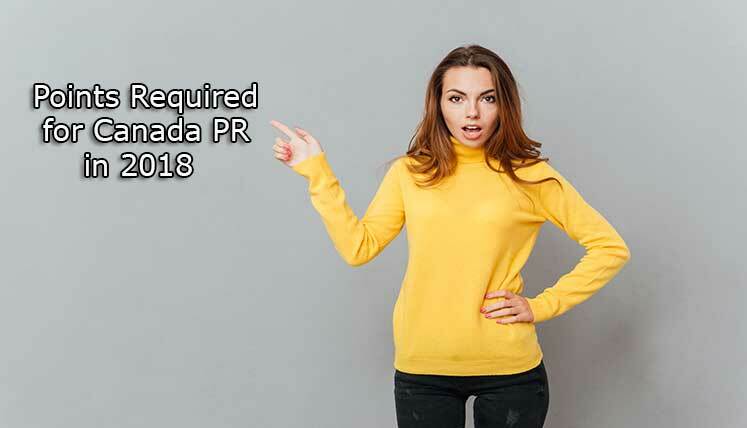 Need assistance to apply Canada PR? If you seek valuable advice along with complete Canada PR process assistance from highly experienced visa and immigration experts, you may call Visas Avenue on Toll-Free Number- 78-18-000-777. Alternatively, e-mail your queries to Visas Avenue e-mail id- info@visasavenue.com.